Ahhhhhhh, she's home! Well, actually off to horse riding lessons now (see picture). I stayed back to catch up. I had planned to take her, but then received a call telling me that if I didn't have a 4 wheel drive, I was going to get stuck in their driveway and that I shouldn't even attempt it. Thankfully, Shayne has a new 4 wheel drive vehicle for the first time ever, so I called him and he came home from work early to take her to lessons. I was also VERY THANKFUL for that awesome truck this morning! (I just wish I had heated seats like he does. They are amazing!) The roads were horrible so I followed Shayne to work and then just continued on from there to the airport, where the roads continued to improve as I went north. When I received a call telling me school was cancelled today, I wasn't surprised. And I had to chuckle, realizing Shayla only missed 2 1/2 days of school all week, as we had 2 1/2 snow days, and just 2 1/2 days of school. I could not have tried to plan that - amazing! We did have a fabulous surprise today! While in Toledo, we went to have Shayla measured for her Jr. Bridesmaid Dress for sweet Tiffany & Chris's wedding this summer. I expected them to measure her, but they had sample dresses to try on. Much to my surprise the size 12 dress was in Tiffany's color. When it fit, with a little room to grow, the salesgirl said I could take that one home now, or have them order a new one. Not living close by, I gladly said, "We'll take it now!" Shayla did not want to leave that bridal store. She was in awe, walking up and down all the aisles, "oohhing and ahhing" and asking me if that price could possibly be right. "Mom, some of these wedding gowns cost FOUR numbers?!" She wanted to try on more little girl dresses, so I let her. (OK, I admit, I tried on a couple "big girl" dresses too, after her insistence.) We had entirely too much fun! I missed her so much! I'm thrilled she's back home! The GREATEST NEWS today happened at Dr. Z. 's Toledo Vision Center! After a complete exam, we learned Shay Shay did not regress in any area and that her eyes have continued to work properly! Praise God! When Dr. D. asked her if she remembered any of this, she shook her head and was shocked. In Shayla's file was a large pile of "D" and "F" reading papers/tests from 1st and 2nd grade. Dr. D. said, "I bet you don't get any of these any more, do you? You're reading well above your grade level!" Shayla was just perplexed as she shook her head and said no. I said, "Actually, she has all As in reading this year and she did last year in 3rd grade too." Dr. Z. asked her if she liked to read now, because she didn't before her treatment. She said, "Oh yes! I took five books to Florida and I finished four of them." As I drove home she said, "I remember getting a couple Fs, but I don't remember all of my papers were that bad." I reminded her that it wasn't her fault. 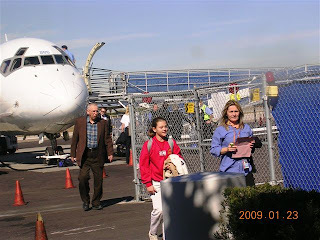 We knew she was very bright, her eyes were just not working together back then and unfortunately, because we were so focused on Christi, it took a while until we could diagnose and then take care of her eye/reading problem. 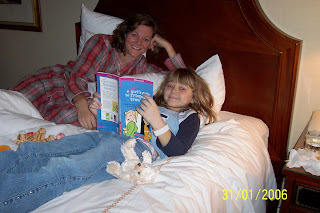 She told me what she remembered was being happy when Christi read to her, or when we read to her, but when she tried to read by herself, she'd keep losing her place. She said her teacher would tell her to follow along, but she couldn't even though she tried. I thank the dear Lord for correcting Shayla's problems. I felt like I was working myself up just like I would before each of Christi's scans, worrying that things had turned sour. We are blessed beyond belief! 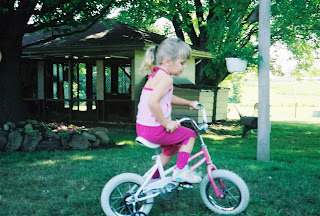 < Christi, age 4 or 5, riding a bike at Aunt Marty's. 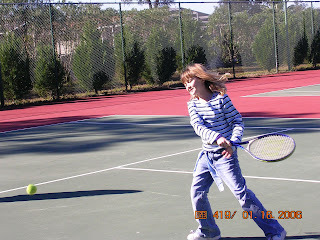 Christi and Shelby, Cousins Playing (age 4 or 5). This week while going through some scrapbooks, I came across something I saved of Christi's. It was a page that said, "When I Grow Up". Oh, that made me so sad and so angry. How could that sweet little girl not have been granted a chance to grow up?! I keep telling myself she's in a better place, but I still can't help but think the best place for her is in our arms. May God continue to give me wisdom and strength. It's times like these when I really really need it! Shayla Humor: While driving today I said, "Shayla, I was surprised when you told me you enjoyed going shopping because you don't like going shopping." Without missing a beat she replied, "Well, it's like this. When I go to a store with you, you say, 'Now what did you need, Shayla?' When I went in a store with Nonee, she said, "Now what do you WANT, Shayla?'. Ah, yes, I got it now! There's definitely a difference. Thanks, Mom and Joe for a "zipping" good time! 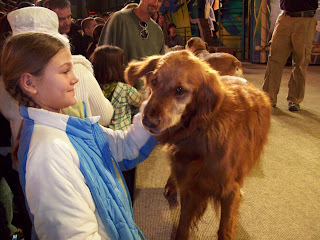 When we were in California in December, at Universal Studios, we were able to meet 4-5 of the dogs used in the new movie "Hotel for Dogs". 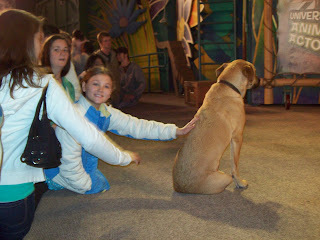 Obviously, Shayla wanted to see that movie, especially since she was able to "meet" real actors. (And when do you actually have "actors" heading your way to be petted?! Hmmmmmmmm.) Regardless, I'm so happy they took her to see this movie for her final "hurrah" with her grandparents yesterday. We took her other grandma out to dinner and she's getting along pretty well with her new hip! I'm now off to the airport! Many schools are delayed due to bad roads so I pray God is with me and that Shayla will arrive safe and sound. I can't wait to pick her up and hug her! After many jam-packed days, they took a break yesterday and hung out at home. Shayla told me she finished two books and she's nearly finished with the other two she packed. (She'll be happy to know that I picked up the two books she had on order at the library when she gets back.) When I asked my mom what they would be doing on their final day together she told me she gave Shayla some options, but Shayla asked if she could do a "combo package". (It must have been hard to decide.) What a hoot! As I told Shayne late last night, "Since no one has told her no all week, why would anyone start now?!" Regardless of what they get into today, I'm anxious for her return tomorrow. She has a very early flight back home and then I will take her to her 11:30 doctor appointment with her vision therapist, Dr. Z, in Toledo. 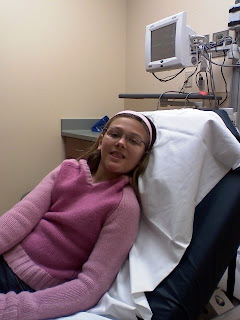 Hopefully, we'll have a good check up, yet I know sometimes "these kids" start reverting back to their old eye problems. I dread the thought of doing all of those eye exercises again, but it truly worked like a miracle for Miss Shayla taking her from reading below grade level to reading above grade level in a matter of months. When Shay told me earlier this week she played "tug-a-war" with a tiger, I had a hard time believing her. Now I see that she did, what fun! She really enjoyed learning about "Egypt" at Busch Gardens. She will return home with a Busch Gardens Season Pass, much to my shock. Mom and Joe have them and apparently, it was "only $2.00 more" to get a pass for a year since she was going for two days. I guess we'll have to go back now, wink. While driving recently, Shayla was listening to me talk with Joe. When I hung up she asked me, "Why do you call him Joe and not Step Dad?" I told her that sounded so formal. She said, "But he is your step dad so why do you call him by his first name? He might think you don't like him because you don't call him step-dad." I told her that I love him as much as I loved my own dad and that he is my dad, but my other dad died when I was in my twenty's so I call him by his first name, Joe, perhaps because he wasn't my dad while I was growing up. We then talked about my deceased father she said she imagines him like Father Joe. When I asked her why she said, "Because in that picture where he's with Nonee, he looks like Father Joe." I had to agree, he does. I also asked her if I talk too much about Christi and she said without hesitation, "(laugh) Of course not! Why would you say that? I miss Christi so much too and I can tell you things about her you never knew." Shayne later told me he was glad I asked Shayla that because he was concerned about that too. Thanks, mom and "Step-Dad" (wink) for blessing our little sweetie with a most special and spectacular visit. She will forever remember this week! THANK YOU sooooooooooooo much! Now don't "forget" to put her on that plane tomorrow morning and keep her. She has a ton of homework to do this weekend. I'm certain the huge snow piles will be calling her name too. As I sit here at our computer, it takes me back to the fall of 2006. Just as Christi's shoes and book bag sat in the hallway beside the door for so long until I got up the courage to moved them, Shayla's now sit in that exact same location. It's kind of odd, freaky actually! Thankfully, Shayla will actually walk back in here in a few days. I am looking forward to that! I just wish Christi would walk through that door too! 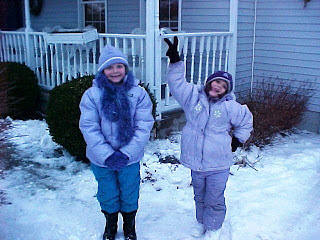 (PIC: Christi & Shayla, Winter 2005) So far we've received just over eight inches of snow over the past 15 hours. It is gorgeous! It just seems quite strange to be home from school, on a snow day, without anyone here with me. Shayla is having a grand time with her grandparents where they have been super busy and she was happy to learn that she didn't miss TAG (talented and gifted) class as it meets all day, every Wednesday. Because of TAG, Wednesday is her favorite day of the week. She's going to go crazy over all this snow! 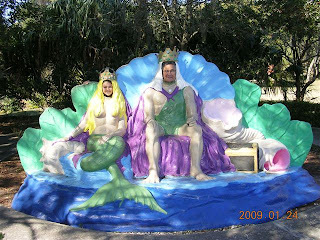 (PICTURE: Shayla spent TWO days with her grandparents at Busch Gardens! I vividly remember them taking the three of us gals there too. Great memories! I just can't put my hands on the pictures right now, hmmmmm!) Although I'm getting a lot of school and dissertation work done, I'm quite anxious for Shayla to return back home. One night this week we just sat at the kitchen table, noting how quiet it was and how we had nothing to do, no where to run Shayla. After a long pause, Shayne asked with a most serious look, "Should we adopt a baby from China?" It was the funniest thing! I told him if we didn't have Shayla, I'd be very interested, but she'll be home this weekend! Instead of starting an adoption process, we curled up on the couch and watched a movie another "angel" parent sent us to make us laugh. We did! Today I'll continue reading "Twilight" and one of my sweet students asked me if I intended to read the next book in the series and when I said, "yes", she offered to lend me her copy of the next book. Earlier this year, I lent her one so I didn't feel bad about taking her book home. My students are the best! And to a certain student I adore, who reads this blog and brings up "items" from it in perhaps a weak attempt to try to get me off task (sorry about your luck), today would be a fabulous day to get your independent reading project done. Hint, hint. As only you would know, I don't want to grade anything that's lame, wink! Shayla likes to stage "funny pictures" and it looks like she got grandma to help her by doing this. Very cute, Shayla! Now please be safe and get out of the tiger cages! Your grandparents are so cool! Remember what I told you when you were playing dominoes with them late last night. Count those blessings and treasure those memories! You are a very lucky and very loved little girl! ENJOY! And.....why are you wearing the same outfit again? I packed a different outfit for each day, despite grandma having a washer/dryer set. Shayla, Miss Independent, I don't think this "clothes thing" is working out so well. LATER POST: I stand corrected! 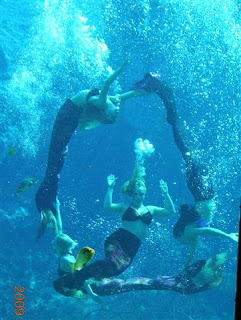 It wasn't "trick photography" that Shayla sometimes enjoys. She actually crawled through a tunnel to then pop up in that glass box under the tiger at Busch Gardens. I was very surprised to learn it wasn't just a reflection as I thought. PS: My mom (grandma Nonee) informed me it is 80 degrees and they are going to the swimming pool now (wow). It was great to talk with you last night! It sounded like you had another wonderful day. I'm anxious for grandma to email me more pictures, hopefully she will do that soon. I feel like I'm staying connected to you that way. Don't worry, Buckeye has not been getting stuck in any closets or drawers like she sometimes does. Buttercup is being totally normal - sleeping a lot, anywhere she chooses! Yesterday I received your amazing grade card. We are so proud of you. You earned all A's, except for a B in math. Daddy is arranging a conference with your math teacher to learn how he can better help you. I know (wink) you're excited about that! On your grade card it was typed: Shayla's insightful comments to class discussions are a great addition. She is able to extend the topic with her life experience and additional readings. This helps bring further understanding to everyone. Keep up the great work! Have a good day, little sweetie! Give some special treats and extra spoiling to grandma and grandpa. You're probably making them VERY tired! P.S. Do you remember this? 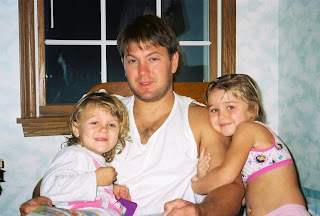 December 2005 - right before Christi got really, really sick. 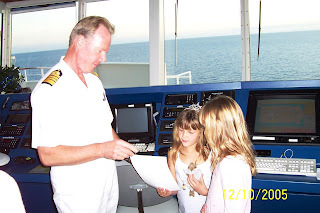 We went on the Disney Cruise and you two got to meet the Captain. He let you push the button to send us back out to sea that night. One of the very last things Christi talked about was how much she enjoyed that special vacation. I hope you're having a great one too! Call when you can tonight. Daddy will be happy to talk with you. I have to work but I'll talk with you tomorrow. Bye, sweetie! With Shay Shay at mom and Joe's I just can't quit thinking about Christi's first and last time there. 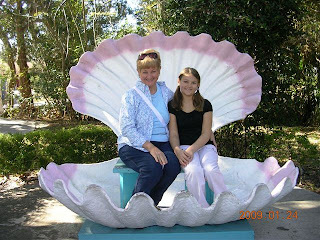 I'm so glad that Christi was able to take that wonderful trip to Florida, spending precious time with her cousins, aunt and uncle and grandparents. Although she didn't feel well the whole weekend, she had moments (see picture) when she was feeling fine. 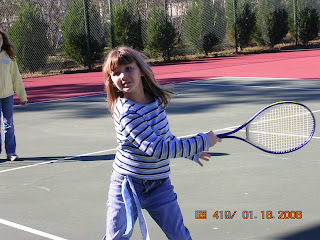 She enjoyed playing tennis with Shelby. 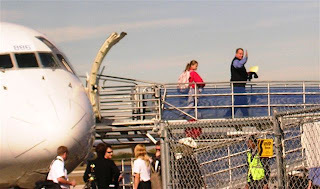 All too soon, the cancer - once again - took off and we landed right back in Philadelphia. My sweet, sweet friend, Shari, flew with me to Philly the day this picture was taken. (Ironically, I have Shari's sweet, sweet, sweet daughter as a student this year!) CHOP told us it was grim. Compounding the horrific news, we couldn't get a room at the Ronald House, nor at any hotel. Sweet Angel Penelope's dad was able to do some finagling and he then put us up at the Four Seasons. When I saw the bill of nearly $500 the next morning under my door I nearly had a heart attack, feeling so guilty. After we were settled in our room, Shari took this picture. I later learned she went out to walk back and forth along our hotel floor, saying a rosary card I had in my purse and crying all the while. (Months later she "decorated" the funeral home for me with Christi's picture and artwork.) I really do believe Christi was very near death here. That high dose chemo she was soon socked with, really did the trick of slowing it down and giving us more months with our precious Christi. I'm so grateful knowing how good friends helped us through horrific times and I'm committed to helping others, since I cannot "pay it back". 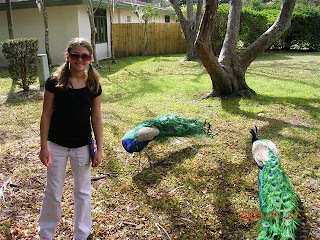 I looks like Shayla enjoyed her nature hike with her grandparents this afternoon in sunny Florida. She collected many interesting things. She always loves the giant pine cones. After church this morning, Shayla picked oranges from an orange tree - wow! My conference and meetings were fabulous; it's always wonderful to learn new information and to meet up with old friends I don't see often enough! My travel home was uneventful and Shayne was working on some home improvement projects while we were gone. It's going to be really odd to be totally childless this week. As I returned a phone call from a student's parent on the way home from the airport, I thought about calling him back and offering to make dinner for his family and babysit their kids this week so he and his wife could enjoy an evening out, but I thought that might come across as odd. I have scheduled plenty of things to do this week, since I won't be driving Shayla to all of her lessons, but it's still going to be quite strange. I'm certain it will make us appreciate her all the more. Yes, I think that is where they were. 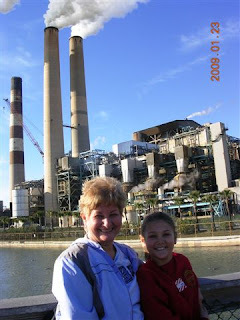 I say that because I see smokestacks in the background and I know they were near or in Tampa yesterday. Beverly - yes! That would have been awesome if you both would have been there on the same day! It appears you live in an amazing place! I am in Charlotte. So far the cab ride and the hotel have been great. Other than stepping out at 6:45 this morning before my first meeting started and seeing that the temperature reading was 52 (ahhhhh!) I haven’t seen anything in the city, but my conference has been incredibly enlightening, motivating and inspiring. My first session this morning was on one of my favorite education topics – National Board Certification. Speaking of my dissertation topic, I’m thrilled to report that I ended up with 104 “Yes, I would like to participate in your study” responses, much to the shock and delight of many. That was out of 673 letters of invitation which were mailed to teachers who certified between 1994 and 1998 and who agreed to have their names and school districts released. Things are going very well with my research. In addition to conducting the two pilot interviews and having the word by word transcriptions completed, I also did my self-interview and the digital recording of my interview (as I’m the “11th” participant in my investigation, the self-study piece). Next it needs to be transcribed word-by-word, a very time consuming task. Earlier this week I mailed out consent forms to the ten NBCTs that were selected with help from my OSU Faculty Advisor. It wasn't easy to make the selection despite the predetermined selection criteria. I wanted to talk with ALL of them and then there was one that actually made me sink to the floor and cry once I opened the envelope. Stapled to the form was a note on school district stationary. It said, "Person's Name Here, would have loved to have participated in your study and to have helped you with your work. Unfortunately, our beloved and treasured teacher lost her battle with cancer last year." My fingers are crossed that the ten identified participants in my investigation will all agree to participate in my study and that I will make phone contacts this week and soon begin working with them. They appear to be a very intriguing group of educators I must add. I really can’t wait to begin talking with them and learning from them. 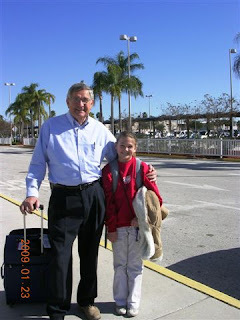 Jan. 2006, days before flying from Philly to Florida for the visit. Christi did a new antibody trial and it was terribly painful. We then had four days off over MLK weekend. It was the same cost to fly home, or to fly to Florida - where my sister and her family were going to be with mom and Joe so we flew South. 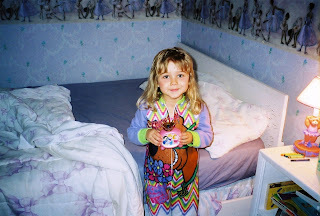 I'll never forget how ill and frail Christi was. As I pushed her in a wheelchair toward mom and Joe waiting for us at the airport, my heart went out to them, knowing what a terrible sight we were and how painful it must be for them to see us. While I do not miss those tremendously stressful times at all, I really do miss Christi. Like Shayla has been emailing with me the past two days, I keep thinking I'd be ok now, if I could just email with Christi. I find I'm again making plea bargains with God. Don't send her back, but just let me email with her. Like the many plea bargains I've tried before ("take my life, spare hers), it just isn't in God's plan I guess. Therefore, I remind myself that I must continue to live my life in a way that will allow me to spend eternitiy with her in a much better place. With Shayla currently at mom and Joe's, I just can't help but continue to reflect back on Christi's only time at their place in Florida. 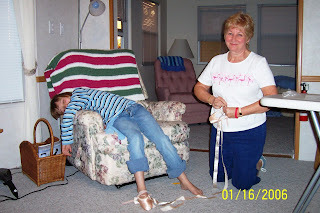 It was here that mom sewed Christi's pointe shoes for me. Christi's acting tired in this picture (my mom has to get things "just so" which means MANY try-ons). What's weird is that Christi was also in the 4th grade with the same wonderful teacher that Shayla currently has (and that Shayne had in 4th grade too). It's hard to believe in a very short time it will be "Shaylauary" and that we will soon have a ten year old. We've never had a kid "make it" to double digits before. That will really be odd to have her 10 when Christi only made it to 9. Trust me, we'll make it a special day, a special week, a special month. We were blessed with a great week! Shayla was under the weather at the beginning, but by this morning she was perfectly fine! So perfect in fact, we left home early this morning and I put her on a plane and sent her to spend the week with Grandma Nonee and Paw Paw in Florida. Then I caught my flight to North Carolina where I’m attending a wonderful teacher’s conference this weekend. It seems very odd, all three of us spending the weekend in three separate states, but that’s just the way it worked out. 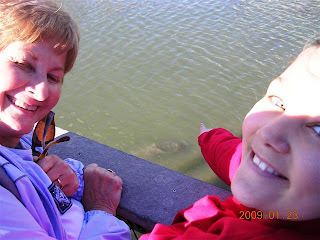 Last winter, we missed my mom and Joe terribly and then Shayne decided, “Shayla is an A student, just because we have to work doesn’t mean she should be penalized and not get to spend a week with them. That would be great for Shayla and her grandparents.” We also talked about how "you never know when or who" and we'd hate to have one of the three no longer with us. The week would give them special memories to forever treasure. Therefore, last summer I booked her flights. She’s been looking forward to this special week for quite some time. After talking with my students after school yesterday, I was a bit concerned that she may be worried about flying alone, but today, Shayla was fine and didn’t mind flying by herself. (My mom actually thought she preferred it.) We are in the midst of reading “The Tale of Despereaux” so I read about ¼ of the book waiting for her to board. I love you. I’ll be fine. Have fun at your conference. I will say hi to Nonee for you. Bye. Love, Shayla P.S. I love you! She had a fantastic day with her grandparents. 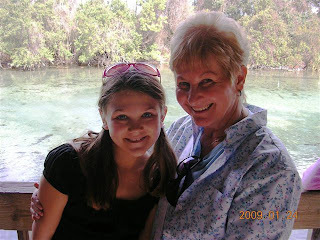 They took her to see a place where about 300 manatees come to get in the warm waters. Fascinating! I wish I could be with them! I wish Christi could be with them too! I guess I should just be grateful she made it down there once before she died. 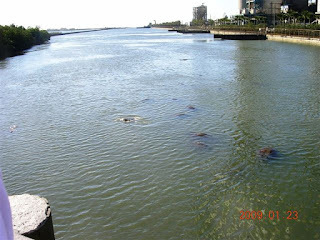 Here she is in January 2006. Was it really three YEARS ago? 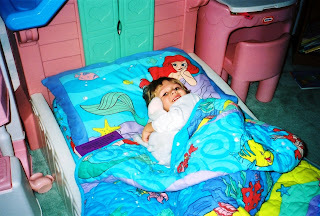 Funny how it seems like yesterday and that she was right here and I could reach out and touch her and hug her. As the holiday season comes to an end, I'm thinking about how my last semester went and how the next one is going to go. I know part of the reason I was able to turn the last three months into a success is because of the Christi Thomas scholarship, not just financially but emotionally and spiritually too! I want to thank you for making this special scholarship available and for believing in me. It was such an honor to receive this award. ............ I want you to know that what you have done for me is truly making a difference. Thanks again! Keep me in your prayers and I'll keep you in mine. If any of my 7th or 8th grade students happen to be checking up on me, as you sometimes tell me you do via this blog, you'll be happy to know that Mr. W. and I graded the semester exams you took on Thursday. Unfortunately, I'm not able to get Progress Book to allow me to log on right now so they are not uploaded, but I'll continue to try. I hope you enjoyed your extra long weekend break and that you used your time wisely to prepare for the reminder of your exams. (OK, "tests" as some of you want us to call them so that you're not scared. Smile.) This is your time to shine! I'm certain, if you properly prepared, you will not be disappointed with your scores. Best Wishes on your remaining exams! I still cannot believe how exciting my picture/negatives find was. This one totally cracks me up. I can just see in Christi's eyes how proud of herself she is. 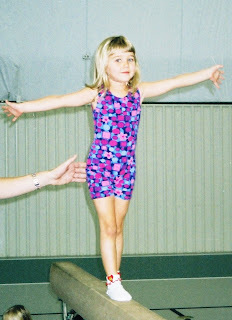 As a 3 and 4 year old, she sometimes took gymnastics lessons a couple afternoons at the YMCA. Great times, great memories! Christi (and Shayla - and all of us) adored the Principal at the girls' preschool. Here is Christi with Ann, a fabulous woman! 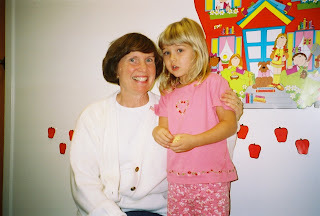 Christi adored her 4 year old preschool teacher. I'm filled with gratitude to now have this photo! Maybe someone was right. 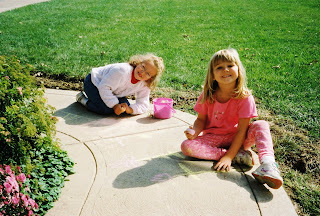 Maybe Christi led me to find those pictures so that I would indeed pick up where I left off with scrapbooking her life. 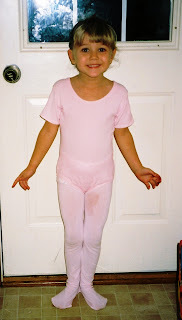 Christi started her weekly ballet lessons at the age of four. This photo was taken one afternoon. After returning home from her lessons, she wanted to show me a new position she learned. Here it is! Wow! (wink) Treasured memories! Finding these pictures was wonderful. This is how I want to remember Christi, as a seemingly "healthy" little blond, happy to do and try anything. Never did I imagine the horrors going on in her precious little body. This is my favorite time period of her life, a time when we were clueless about cancer. I long for those great times! Before Christi's very first dance recital pictures, this little brunette sweetie's mom and I took the girls to the beauty school in town to have their hair prepared and their nails painted. Christi wasn't sure what to make of all of that fuss, she had just turned five, but I do remember she liked it. 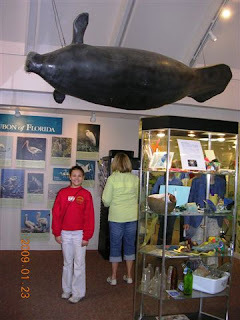 Interestingly noteworthy, the little friend beside her is now one of my students. She is a delight. While picking Shayla up from dance one night this week, I poked my head in to watch her and another one of my students dance for a bit. They are awesome! Then as I glanced around the room, I immediately saw the other girls in Christi's class - so grown up, dancing marvelously and I had to take off as tears came out of nowhere. I just wanted to see Christi back with her class practicing again like she loved to do each week she could. She adored her dance classmates and teachers. They are wonderful people. I watch those girls come to class each week and I'm ok, but something about seeing them in action dancing, and dancing at a whole new level, just hit me hard. These pictures make me want to remind any interested Senior at Dance Unlimited that we will be sponsoring, for the third year now, a $1,000 Christi Thomas Memorial Scholarship. We will present it in June. I'll soon be sharing all of the scholarship information for this year. We have the selection committee of five individuals in place, but we have a bit more work to do before making this year's announcement public. We thank all who have been involved and who have generously given to the Christi Thomas Memorial Fund, allowing us to keep her memory alive and to help other young men and women. STITCHES AND NEE NEE UPDATE: Yesterday we were blessed with another snow day due to temperatures well below zero. (I say "blessed" now, but I can only imagine what I'll be saying in June when we're making them up - hee hee!) Shayla did some scrapbooking while I sat on the other side of the table working on "stuff" for my dissertation. (It's going incredibly well. I actually ended up with OVER 90 willing NBCTs out of the 673 letters of invitation. That is a great percentage in terms of research solicitation. My advisor is equally ecstatic.) Now I'm in the midst of the purposeful selection process this weekend, working closely with my Advisor, to determine the 10 National Board Certified Teachers and the five alternates. This is all based upon predetermined criteria I set and wrote about in my chapter three. This whole process has been tremendously exciting! I'm in "discovery mode" and cannot wait to see what I will find. My Advisor recently wrote, "Angela is doing groundbreaking research that has never been done before. Knowing Angela as I do, substantial articles will be published following the competition of her research." We also went to visit with Nee Nee yesterday. When we arrived at the facility, she was in therapy. The therapist was so sweet, she allowed Shayla to be involved helping Nee Nee. It was absolutely precious. Due to their many postings about not taking pictures at the center, I wasn't able to capture those great images. They were wonderful and I hope they never leave my mind. 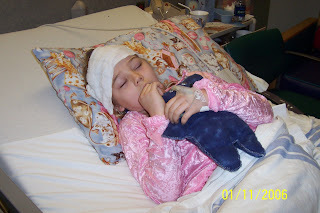 Nee Nee is doing great and should be "out of there" soon with her brand new hip -and with a TON of pictures Shayla has made for her over the weeks and decorated her room with. May God continue to heal and bless Grandma Nee Nee. This morning Shayla's stitches were removed. She was quite apprehensive, but did great! Yesterday I bought the anti-scarring cream and I'm certain she'll be fine. I think she actually enjoyed all of the special attention she got at school as many asked her about her accident on the playground. What a hoot! Thank you for your love and concern; Shayla is doing great! No problems! The stitches come out on Saturday. I purchased "anti scar" cream and I don't think anyone will ever be able to see her little recess boo boo! 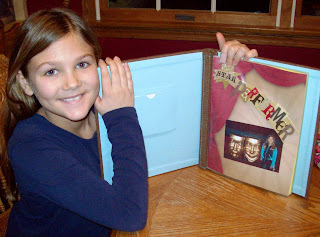 Shayla has really been into the scrapbooking and I think she’s doing a wonderful job. 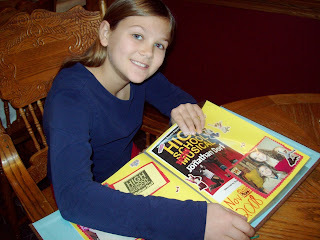 She’s already mentioned that when she’s finished with her drama book for her 4H project, she’d like to make a scrapbook of her activities (dance, horse, skating, skiing, etc.). Well, Miss Shayla, has me about ready to get started. As she’s now working independently (for the most part) I keep thinking I should start working where I left off: “Fall 2002” on the other side of the table for my own scrapbook. I knew the day would come when we'd have an ordinary / normal trip to the emergency room. I remember with our cancer journey longing to have something normal happen instead of fighting what we were dealing with. Finally, today it arrived - and trust me, I'm not making light of the incident or the result, but I know what's "bad" and this was a welcome treat compared to cancer. As the end of my final class of the day was nearing, the phone rang. It was the school secretary telling me Shayla was outside at recess and had an accident on the slide. 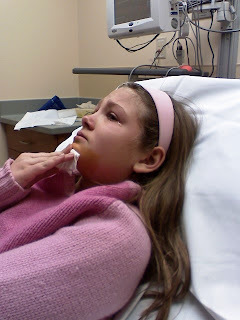 They felt she needed to go to the hospital to get stitches on her chin, but they wanted me to come to the office to see what I thought. Thankfully, my teacher friend across the hall had her planning period and offered to watch my class. When I got to the office I had to agree that it was bleeding at a pretty good clip and was cut open more than a normal cut so I went back to my room to gather my work for the evening. My seventh graders were so so so sweet when I told them what happened and that I had to leave them with the other teacher for the last 15 minutes and we'd have to finish what we were doing tomorrow. They told me things to tell Shayla of their own experiences, that it wouldn't hurt, that they'd pray for her, etc. It was precious! I love my students! Sitting with Shayla in the waiting room and again in the treatment room was terribly odd. She's Christi's size now, but yet has this long hair. I cannot even describe how eerie it all was. She, like Christi, was very frightened. She, like Christi, did terrific and after three stitches was all fixed and ready to go home (or actually back to school for musical practice). August 2006: Shayne’s dad was in town and we went to take him out for ribs in New Riegel. There was a wait for a table so I decided to walk the girls across the street to the scrapbook store to pass the time. Christi fell in love with the store and I suggested she could start a scrapbook if she’d like. She picked out two papers (animals) and a sticker sheet (animals). 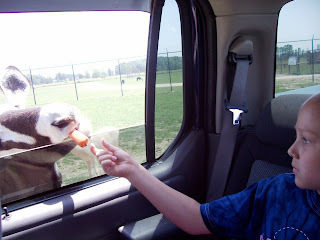 She said her first page would be about our summer trips to the African Wildlife Safari Park. Shayla picked out “My First Day of 2nd Grade” papers as school had just started. Unfortunately, that was Tuesday and by Friday Christi was in horrific off and on pain. Sunday was her final trip back to Philadelphia as we knew things had taken a terrible turn for the worse. I came across those untouched pages in the scrapbook tub we went through the items in the morning. To see them that morning hurt my heart and then to have it happen all over again that afternoon in the store was freaky. I really miss her! She wasn’t perfect, but she really was extraordinary and I loved her to piece! Shayla was surprised at how long it took to get everything just right and to make decisions, but when Shayne came home from work she was beaming with pride, anxious to show him what she’d done during the day. I was simply marveling at her two pages myself. She also spent her “snow day” learning how to cook eggs and creating lots of art for Grandma Nee Nee’s room while I worked on lesson plans and dissertation stuff. Nee Nee was discharged from the hospital in Toledo and now is at a closer location where she is having her therapy since her hip replacement surgery. While talking with her on the phone I was able to ask her exactly what happened. She parked her vehicle and was walking to meet friends when she heard her hip crack and down she went. She fell in the parking lot and could not yell even though she tried and knew she should. Meanwhile, someone came out and got into their truck, backed up and drove off. She doesn’t know how they didn’t back over her because it was so close and they obviously were not able to see her on the ground. When she didn’t show up, her friends looked and could see her vehicle out in the parking lot so they went looking for her and there she was on the ground. (Thank God for friends!) The ambulance came about an hour later and transported her first locally and then to Toledo. (PIC: Coloring by Christi, 2004, age 7) We thank God that she did so well with the surgery and that she seems really happy in her new location where she’ll be staying for some time. Shayla did a fabulous job decorating her room, talking a lot about how Christi’s room was always colorful with things hanging on the walls and things for Christi to do. It was terribly odd going to visit her. It was in the evening and no one was around. (Our favorite time with Christi in the hospital because it was finally, in the evenings, when we felt like we had some privacy and could be a family, not waiting for someone to walk in and give directions or something). As we pushed Nee Nee in the wheel chair around the center looking for something to do, it was really was eerie as I kept looking down in the wheelchair expecting to see Christi. What also struck me as odd was that Shayla was suddenly so tall. 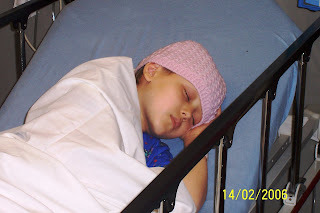 During our hospital times together, Shayla was so little (ages 3-7) and suddenly it was like I wasn’t watching out for her too, but she was tending to the one in the wheelchair. Shayla’s anxious to get back and visit with Nee Nee because there is a wii there that Nee Nee has been playing and Shay wants to set up an email account for her grandma so they can email. Nee Nee is willing and just beamed to have us there visiting with her and eating her snacks. What a hoot! I love her so much! Another big snow storm hit last night and it's still coming down. Shay still had her horse riding lesson and when we were all outside in the snow late last night it was still, surreal, and simply gorgeous. I wondered if Heaven could be so lovely. Today the other two family members are talking of going skiing yet this weekend. I think I’ll pass this time and stay back to continue work on my dissertation. (Entering all of the data I’ve received thus far is taking much longer than I anticipated.) I cannot even explain how exciting and empowering it is, and how very well it is going. (Or the fact that things seem to take longer than you’d ever imagine, hee hee.) Nearly 700 “invitations to participate” were mailed out on Dec. 26th. I worried over the trip whether anyone would be willing to work with me, especially with zero compensation. I kept thinking how will I expand my recruitment efforts when no one responds. When we returned home from vacation a week later, I had received eight “I want to participate” questionnaires which was simply shocking to me (and my advisor). As of today, I have nearly 40 and the due date is not until Jan. 14th. I will soon be working with my Advisor and following my predetermined purposeful selection process to identify the ten National Board Certified Teachers I will be studying. Also this week I had another big step forward as I conducted my two pilot interviews on my friends. Now I’m working on the time consuming word-for-word transcriptions. I’m so grateful Stephanie and Jerry agreed to help me as I value their insight so much and really appreciate their time as they’re incredibly busy individuals. I never have enough time to talk with my teacher friends so this was nice as after we finished our work, I called back just to chat and to learn what I needed to change. The SMART board I wrote the grant for this summer and received was installed in my classroom over break. I’ve been having a blast learning how to incorporate the many interactive components involved. (And my amazing 6th graders have been teaching me “tricks” to learn and giving me little things to practice before the next day when they check up on me – so cute!) One of my 7th grade boys said to me during a lesson, “This class is better than cable TV.” I responded jokingly, “The grading period doesn’t end until next Friday; you don’t need to start sucking up yet. You’ve got some time.” He said, “No! I’m serious. Your class is really fun.” (Something about challenging the ladies to the gentleman in a game format always brings out incredible competition, adding the power of the SMART board has the potential to make that work even better I determined this week.) Although we had an incredible vacation and an amazing break, I learned it was nice to be back to work. I really missed my students and colleagues!